So, I made plans to go to Quilt Market in Kansas City next month! I'm so thankful to be going and have been chatting with some blog friends and industry professionals who I'll get to meet there. But first things first -- I need a cute place to put my business cards. Enter the Keyka Lou Business Card Wallet. The semi-retired pattern on sale for $3, and it is super easy to follow. It doesn't take much fabric, so you could use fat quarters or large scraps. I chose Amy Butler Lark for the focus fabric and Joel Dewberry Heirloom for the lining. This was my second time using metal snaps, and it really isn't so bad. If I were making this wallet over again, I would choose a matching thread rather than a contrasting color. The wallet ends up a little thick (I added an extra layer of batting) and it is hard to keep the stitches straight through the bulk. My friend Sara is making a new dress for Quilt Market. I may need to work on some new duds myself, although I'll be the first to admit that my to-sew list is a little overwhelming. But the good news is, I'll have lots to share with you coming up, including my New York Beauty tutorial, a wedding sewing project, and some summer sewing. Have you tried any Keyka Lou patterns? Which are your favorites? Oh, have fun at Market! 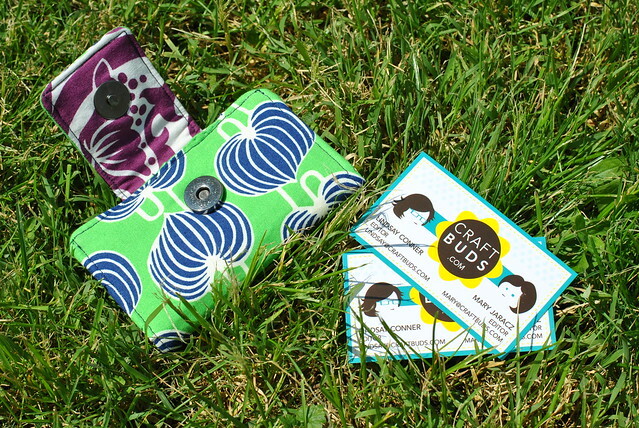 Your card wallet is cute and so are your cards! I have only used one of her patterns so far (the camera wristlet), but there are several more I would like to make at some point. I love all of the patterns from Keyka Lou! When I was teaching sewing I used the Eco Market tote pattern (so many times that I memorized it). 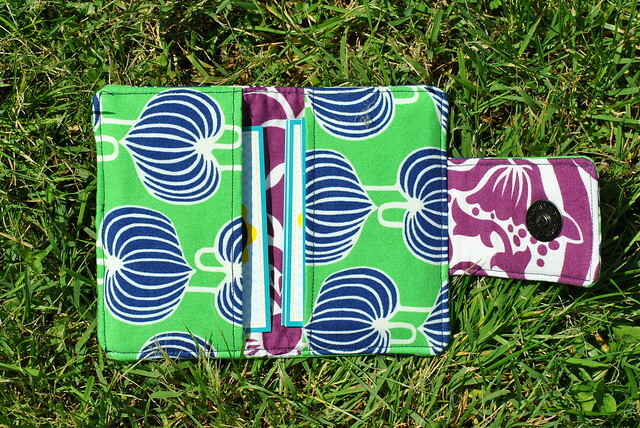 I've also used the laptop cover pattern for a class pattern. I find her patterns to be super easy to follow and fun to make. Plus Michelle, the brains behind Keyka Lou, is so sweet and fun to work with. I hope you have a good time at Market, I've always wanted to go to Spring market but it's quite a distance for me to travel so I usually stick close to home and just go to the Fall Market in Houston in October/November. I realized how much I need one of these at the Snap Conference! So cute! this is beautiful and so useful!